220 volt outlets are the most powerful plugs that you’ll find in most residential homes around the United States. These plugs are meant for ovens, dryers and other high-powered appliances that you simply can’t power with a standard 110V outlet. If you plan on renovating your home, or adding additional appliances to it over time you may need more 220-volt outlets than you currently have. Fortunately you can have them added in as you go, as long as you are willing to spend the money to upgrade your electrical system. When looking around your home you’ll notice that some outlets are larger and different looking than all the rest. These are the 220-volt outlets that you can use to power your more demanding appliances, tools and equipment. They have between three and four prong holes and you might have to change the cords on some of your appliances such as your dryer in order to make them work with your current 220-volt outlets. There is one major difference between a 3-prong and 4-prong 220-volt outlet and that’s the missing prong. In a 4-prong outlet there is two power lines at either side of the outlet. The bottom is the neutral line that’s dedicated to bring power back after it passes through your appliance, and at the top is the ground. A 3-prong outlet doesn’t have a port for the ground and instead relies on a metal strap or harness to ground out the appliance. This is a bit less convenient and a bit less safe than the 4-prong styled outlet, and that’s why all the modern outlets are 4-prong. 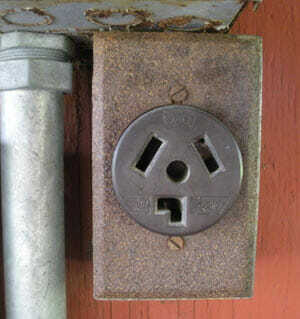 If you have a 3-prong outlet you don’t have to bring an electrician in to convert it, though that would be a good idea. Instead you can simply switch the cord on your appliance to a 3-prong cord and attach a metal strap to ground out the appliance. Many electric dryers come with a place for the screw already in case you need to attach such a strap. If you’re planning on expanding your home, or adding in more high-powered appliances you’ll likely need to add some additional 220-volt outlets to your home. This can be costly depending on where the outlet needs to go, and it’s not something that you should try doing on your own. The good news is that you will likely be able to add all the outlets that you need for any appliances you want to have put in your home. The bad news is that you could spend quite a bit of money on both having outlets put in your home and on upgrading your electrical service to handle all the increased demand for power from your home. Adding a new 220-Volt outlet to your home usually isn’t that expensive, but it really depends on where the outlet is going to be placed, and where your electrical box is in your home. It also depends on whether your current electrical supply can support another 50Amp breaker or not. Wire is quite expensive and can cost as much as $6 for every foot that it has to be run. That means if your outlet is 50 feet away from the box you’ll be spending between $200 and $300 on just the wire depending on pricing. Very short runs are quite affordable, but long runs are more expensive because of materials and the work involved. Running wire over a long distance takes longer than running it over a short distance. The price will go up for every wall that the electrician has to go through and every floor. It will go up for every difficulty that is added into the project and the further the outlet is from your power source the more you’ll pay for it. If you only have 50Amp or 100 Amp service running to your home currently there is a good chance that you’ll have to upgrade that service to 150 or 200 Amps in order to be able to add another 220V plug to your home. If this is necessary you can expect to spend between $500 and $4,000 to have your electrical service and panel upgraded to support the new outlet. Determining the overall cost of adding a 220V outlet to your home is difficult to do and depends on a bunch of factors. A short run might be done for as little as $400, while a long run might cost you closer to $1,000. If you need a panel upgrade you might spend as much as $3,000 or $4,000 to have the job completed. The only way to truly find out is to have an electrician come to your home, see where you want the outlet installed and give you a quote on the project. Any home outlet is dangerous and can pass a harmful amount of current through your body if handled improperly, but 220-volt outlets are even more lethal. That’s why it’s important to have a seasoned professional do the work for you, instead of trying to tackle it yourself. If you need a new outlet put in your home let the electrician do the work and save yourself some trouble. Not only will you be safer by hiring out the work, but you’ll know that the job was done properly as well.